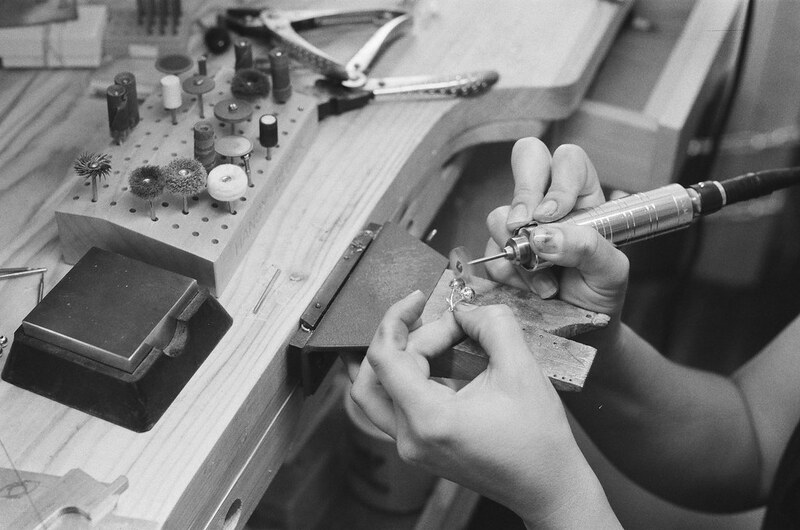 The task is simple: take six different and unique jewelry designers and understand their point-of-view as a maker and creative. 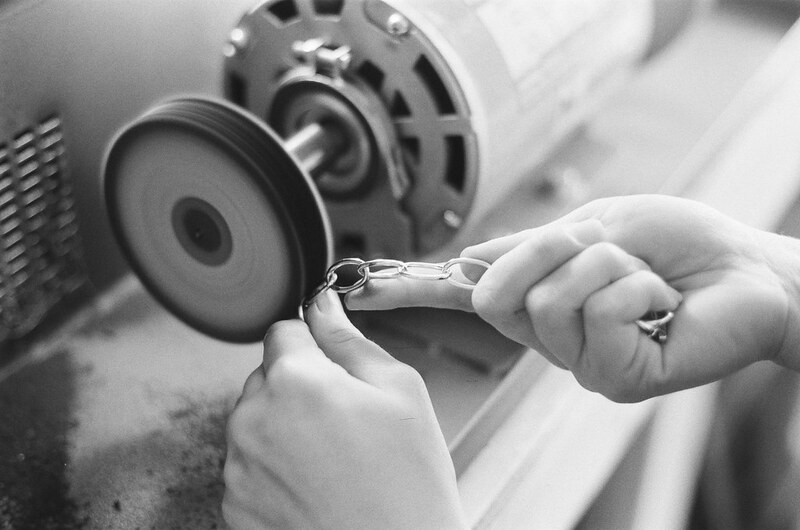 Everyone’s story is their own, as distinguished backgrounds converge with experiences, and each designer’s path will reflect where they’ve been on their road to jewelry dreams. 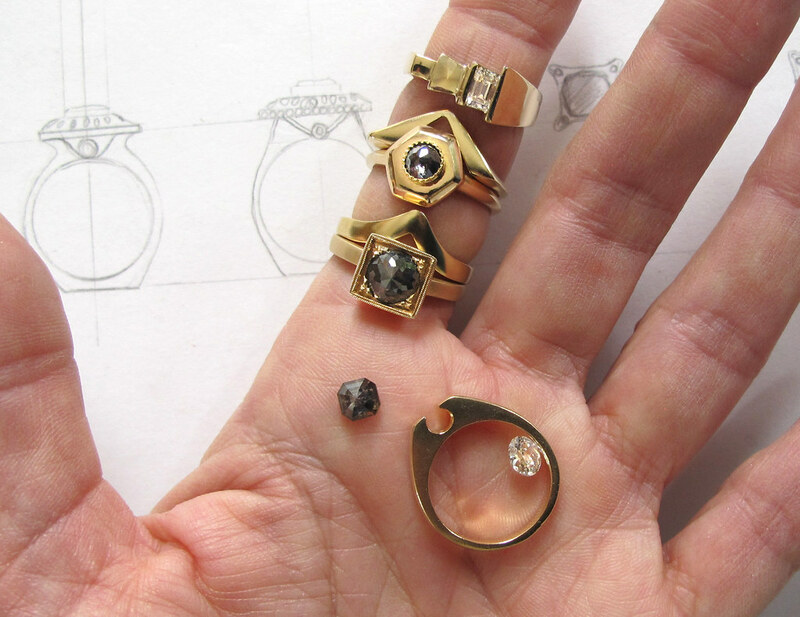 The end result as a designer is jewelry that began as an idea and ended with an executed, finished piece of jewelry. Each design has its own style, price point, technique and forged in its own way, however everyone started with the same elements–some gold! 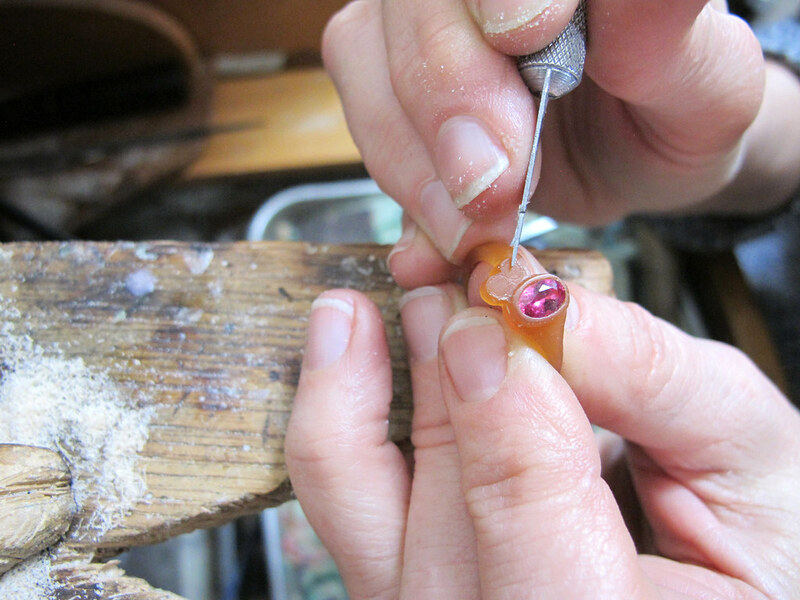 I’ve teamed up with May is Gold Month to interview and take a deeper look at six makers. I’ve asked each designer the same two questions and received incredibly different responses. Let’s explore their answers and learn more about the common thread which each story shares: GOLD. 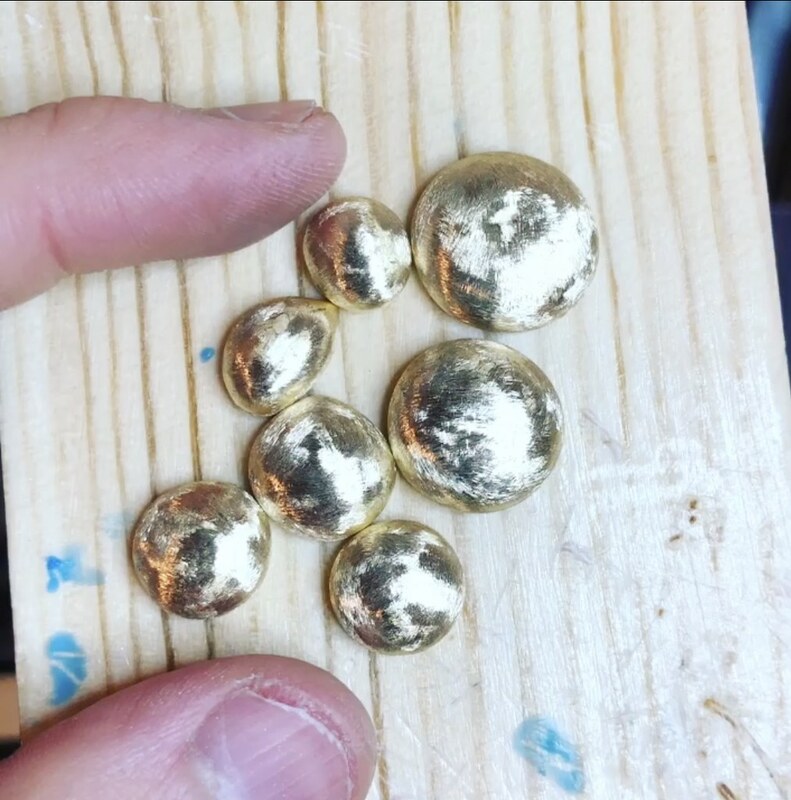 How is karat gold important in your work? Gold has been a symbol of value and luxury for most cultures. For me, I just love working in it. It’s like cream, with sensuous fluid elements that challenge me as an artist, I respect it. For the last 5 years I’ve been working with Fairmined gold, which is a certified support system that insures the gold is mined ethically and environmentally correct. 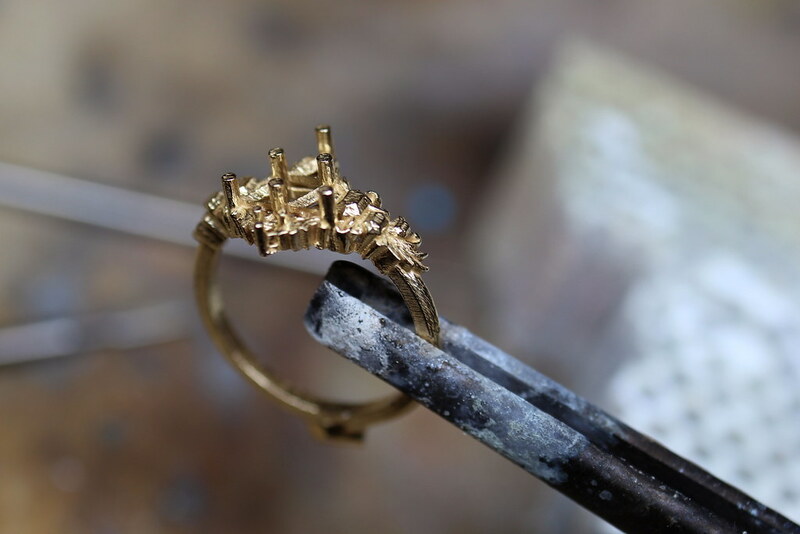 Fairmined creates a solidarity of cultures, from miners to jewelers that puts the miners, jewelers and consumers at the same level of importance. I like that, because the gold they produce is not only mercury free, but it also supports the stories of all the people that touched it along it’s journey. 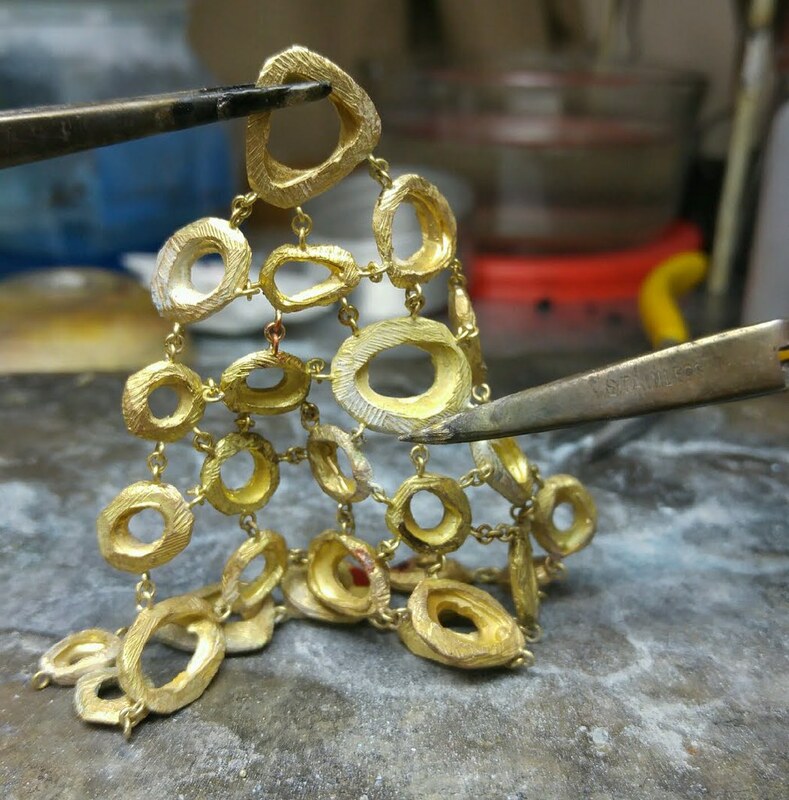 Why do you like working with karat gold? Using the analogy of textiles, gold is like silk. When you work with gold, you can feel it’s heat, it has a warmth and weight combination that really is its essence and energy. Minerals are unique that way. 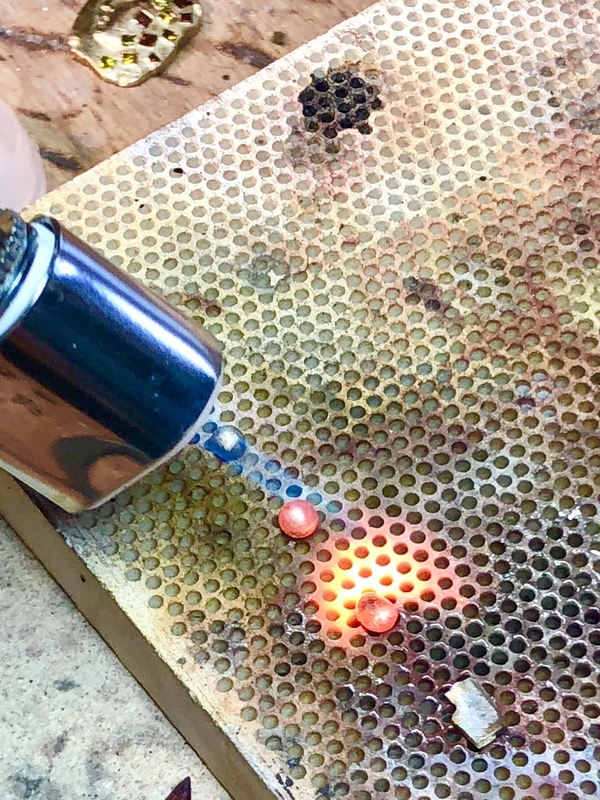 Once you work with gold, the way it bends, the way it solders, the way it finishes, it is addictive. Learn more about East Fourth Street here. Gold is the medium in which my creative ideas transmute into reality. After spending years collecting gold jewlery and admiring museum exhibits of gold artifacts from any and all periods of human history I decided to learn how to work this majestic metal. 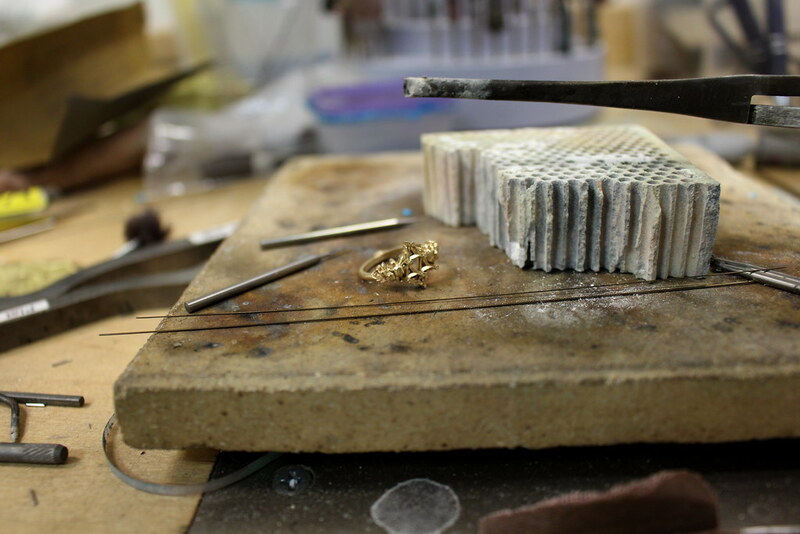 I mainly focus on the stone casting process which directly sets the stones in my models into the gold. The result is a fresh cast gold piece that not only has the shine and luster of gold but also the brilliance of the gemstones I set with it. There is nothing more euphoric than to see one of my wax models turn to beautiful solid gold. It feels like I unearthed a treasure that only existed in my dreams. The whole process of turning that freshly cast piece into a beautiful shining object is so fun. The option of finishes that gold offers are plentiful being a whole journey on its own. All leading to that blissful moment when a finished piece is looking right back at you. Learn more about Lu Rebuffo here. Gold is everything! I have two lines: a lower end 10KT and sterling silver line and then my Couture line which is ALL 18KT yellow. That line has bright sapphires and diamonds set in 18KT yellow gold. 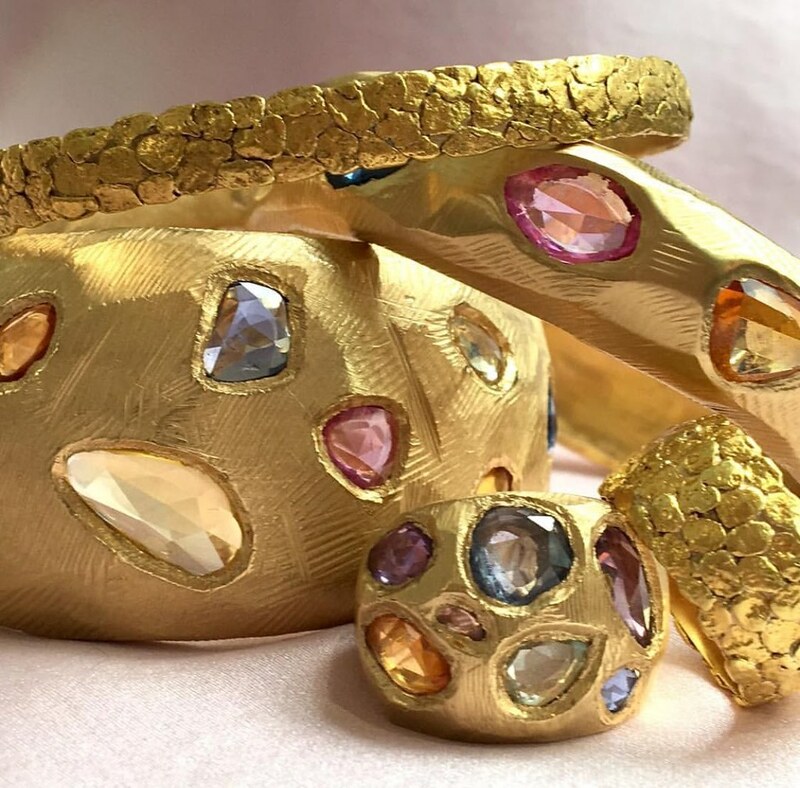 My modern, organic texture contrasts with the richness of the 18KT yellow so you feel like you’re wearing something old and new at the same time. I’ve tried my designs in platinum before and it looks totally different – very modern. I like the platinum, but it just feels so different, there’s no warmth to it. First of all, the history of gold is amazing – it’s the basis of our dollar – the “gold standard.” I have 2 boys and I’m struck at how many times gold is part of a story we’re reading – from the gold bounty in Treasure Island or a mining camp with gold “nuggets” in Lego sets, the fact that gold is powerful and valuable is known from a young age. I have a gold nugget that my 3x great uncle mined out west. What else would be saved and given down generation to generation? And what else would be still worth it’s “weight in gold” – sorry for the bad pun, but it’s true! But secondly, casting my pieces in gold is the best. 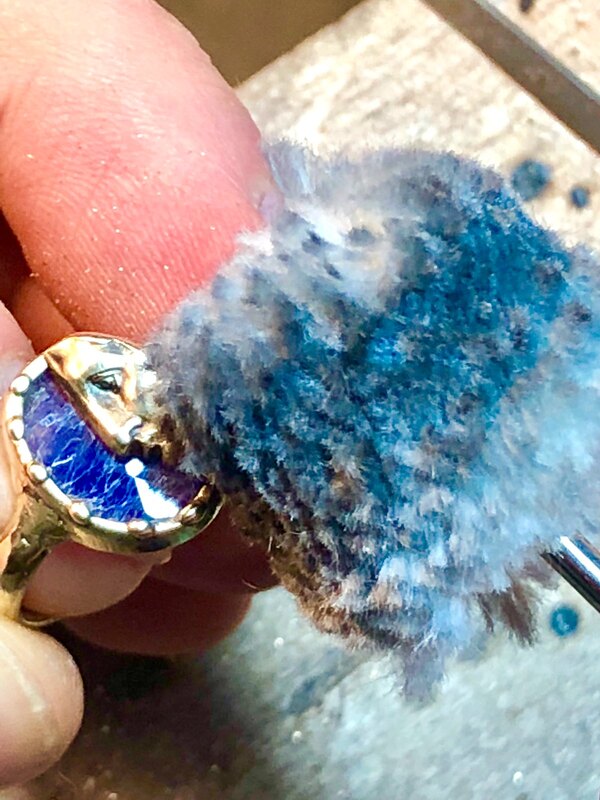 I work in wax and often leave the file marks on my wax so you see the “hand of the artist” when you’re wearing my pieces. For 18KT gold rings, these file marks soften over time. I always tell couples whom I make wedding bands for that it’s sort of like a marriage in that it softens and smooths over time. Learn more about Page Sargisson here. All of my jewelry designs are inspired by video games, so I always try to maintain a feeling of magic and fantasy. I want my customers to feel regal when they wear my jewelry, so gold is the perfect choice. Gold is rare, beautiful, and has been used in jewelry since ancient times. The name of my jewelry company – Soulbound – is a term used in video games to describe items that cannot be given to another player. They are bound to that player’s soul. Items that are “soulbound” are typically rare and powerful. 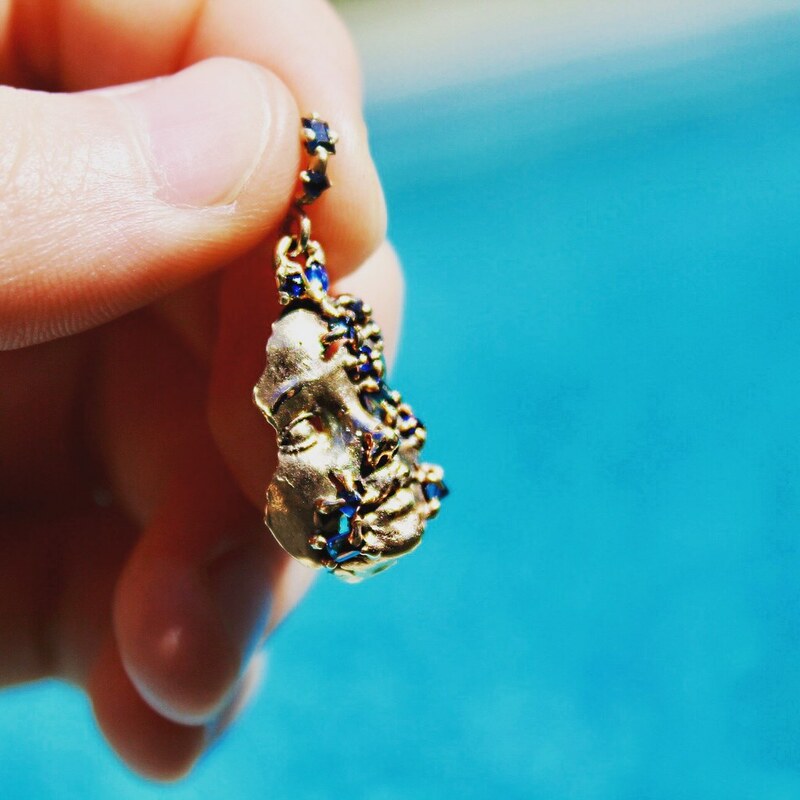 I love working with 14 karat gold because I know it can withstand being worn by my customers every day, on all of their adventures! I want my jewelry to last a lifetime and be “soulbound” to its wearer forever! Learn more about Soulbound here. In my work, I try to evoke the glories of past cultures as it relates to the vibrancy of our modern times: memories and the present moment in which memories are formed. Gold is the perfect medium and the ultimate canvas to express this dynamism. Since the dawn of civilization, humankind realized there is something out-of-this world in that metal as there is something out-of-this world in ourselves. In a gold object or piece of jewelry made by human hands, the most elevated element in nature coexists with what is most elevated and profound in us, that is, the spark of life, the ability to create and transform. I like to work in gold because it enhances the design and the composition of the piece. Gold also lends clarity and radiance to the stones with which I accompany my pieces. On the other hand, the amazing physical properties of gold, such as softness, malleability or its resistance to corrosion, make it relatively easy to work with. There is another element -more elusive perhaps- and that is the effortless centrality of gold. Learn more about Atellier Narce here. Gold is the most important element in my work, it is the foundation of my collection. The first piece I designed, the Serpent of Eternal Love ring, was carved in wax and cast in gold. I wear that first edition every day. Nothing feels more special than a big chunk of gold on your hand. Learn more about Vada Jewelry here. This sponsored post was brought to you in collaboration with May Is Gold Month.